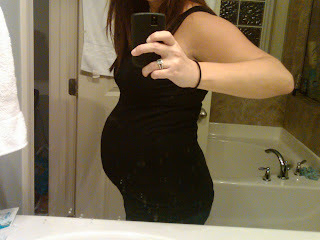 Seriously, I know I say this every week...where have the past 21 weeks gone? As I said earlier, I haven't been stressing much yet because I kept thinking to myself, "I'm not even halfway there, we have plenty of time." Well friends, the time has come to get on the ball! Size of Geronimo: A banana. She's growing up so fast! This week, Geronimina's womb is currently stocked up with her lifetime supply of six million eggs. The number will apparently drop to around one million by birth. That is a lot of eggs. Weight Gain So Far: I weighed in on Friday and then again this morning and according to my home scale I'm around +6. I'll report back next week after my doctor's appointment. Cravings: Still chili! I had my chance to make it over the weekend when it was so cold, but didn't - and now it's warming up a little. Soon enough! Other than that, nothing new to report. Symptoms: Nothing really new to report here, either, except my skin is pretty itchy, so I've been making sure to give my skin some extra TLC and moisturizing. Also, this week for the first time I had a nose bleed. One more weird thing that I've noticed, which is unusual, is hair growth. I can't remember if I mentioned this before or not - probably not because it's pretty strange - but the hair on my stomach all of a sudden resembles a woolly mammoth, while my leg hair hardly grows at all. Now do trust that I am not complaining about the lack of leg hair, but the stomach hair freaks me out. I have talked to girlfriends who told me that's completely normal and it will go away post-baby, but it is so weird. I have been telling Dan he's going to have to help me wax it. Yuck. And ouch. Movement: I am pretty sure we have a future kickboxer/aerobics instructor/dancer/gymnast on our hands. She goes NUTS, y'all. It is so neat to feel, I wish I could describe it. No one else can feel it yet - Dan thought he felt it once before, but hasn't been able to since. On one hand it is annoying because I REALLY want him to feel it, but on the other it's kind of neat that only I can feel it. Cheeeeeeesy, I know. What I Miss: Cute clothes! As I mentioned yesterday, I went shopping with Katy over the weekend and we bought some GREAT stuff, so I've been missing being able to shop with all of the fun new fall clothes coming out. Things I am Thankful For: Feeling extra thankful for great friends this week. You know who you are! What I’m looking Forward To: VACAY! Yep, another one. Can't believe it's already here! We've been trying to make it out to California to visit my girlfriend Sheila for what seems like forever. I was able to make it out by myself the year before last, and had such a great time, but I've really been wanting Dan to be able to go with me. SO, now we are going and I can't wait! We are going to be there for over a week - we're spending the first part of it with Sheila in Newport Beach (Orange County). After that, we were lucky enough to be able to coordinate with my brother-in-law Chris and his wife Andrea, so we're going to meet them in Palm Desert for the remainder of our vacay. Seriously can't wait. Next Doctor Appointment: Friday. I don't think there's anything crazy with this one, just a normal check in with the doctor. I'll report back next week! Not too much in the way of updates, I guess, but I'm trying hard to keep track of it because I think it will be fun to go back and read later, after Baby Baum has made her debut. We went on our first two daycare visits today, so I'll report back on that in another post this week. Also up this week, more gifts (!!!) as well as something I ordered which arrived last week.